DermaFrac is a dermal micro-needling (skin needling) machine that offers simultaneous delivery of infused ingredients in a pain free, no downtime treatment that can be administered by our skin therapist’s. 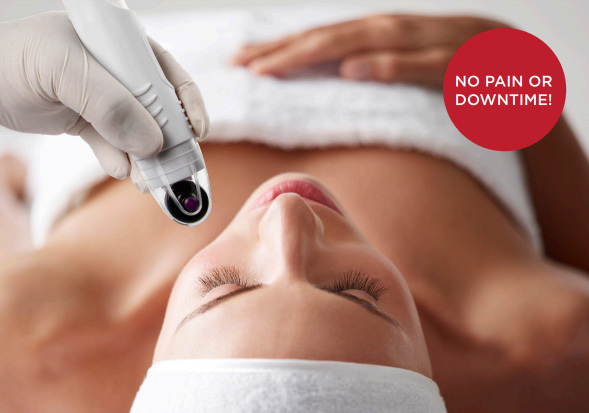 The DermaFrac machine takes micro-needling to a whole new level. DermaFrac treatments are available in our Berwick, Beaumaris and Templestowe clinics by appointment. Call 1300 863 824 to arrange a consultation. By combining precisely calibrated needle penetration and unprecedented infusion capability, DermaFrac creates micro channels to the dermal junction while simultaneously infusing topical serums to this all-important tissue layer. The DermaFrac system uses a unique combination of technologies to enable an improved micro-needling procedure along with immediate infusion of a powerful active serum. The precision-controlled DermaFrac hand piece pulls the skin under vacuum into contact with hundreds of micro-needles that painlessly penetrate through the epidermis and into the upper dermis (the papillary layer). The vacuum permits an all-important even penetration to the full depth of the needle and can be adjusted to make the treatment deeper. DermaFrac micro-needles create pathways for introducing the infusion serum into the skin. Dermafrac skin exfoliation process reveals the new, living skin cells that are soft, smooth & receptive to nutrients. This procedure will also stimulate new collagen and elastin production thus improving fine lines and texture. The depth of needles on the DermaFrac hand piece has been carefully selected so that the channels are created just below the dermal-epidermal junction and just above capillaries and nerve endings. This ensures no bleeding or pain. Hydrate – This serum uses Hyaluronic acid with a patented technology called Hylasponge to form a fully hydrated layer that helps guarantee that hydration is delivered into deeper layers of skin. It also delivers intense hydration to reduce the appearance of fine lines and wrinkles. Clarify – The clarify solution features two key active ingredients. Salicylic acid opens clogged pores and neutralizes bacteria within the pores. It reduces pore congestion and breakouts on skin. Lactic acid, part of the alpha hydroxy acid family, exfoliates the outer layer of skin and increases collagen production to minimise fine lines and wrinkles and reduce blackheads and whiteheads. Rejuvenate – This serum has five active ingredients that stimulate fibroblast and collagen production in the skin. They also help relax muscles to prevent wrinkling from repeated muscle movement. Lighten – This serum utilises Kojic acid to lighten skin by suppressing melanocyte activity and pigmentation. It also has antibacterial and anti-fungal properties. Growth Factors Rejuvenating Complex- Rejuvenation at it’s finest! This is a rich blend of growth factors, moisturisers, peptides and vitamins for younger looking skin. Vitamin C – Vitamin C 2% Ethyl Ascorbic Acid is an antioxidant that slows the rate of free-radical damage. Free radicals are unstable molecules that damage collagen and cause skin dryness, fine lines and wrinkles.